This picture was taken after one of our snowfalls last year. 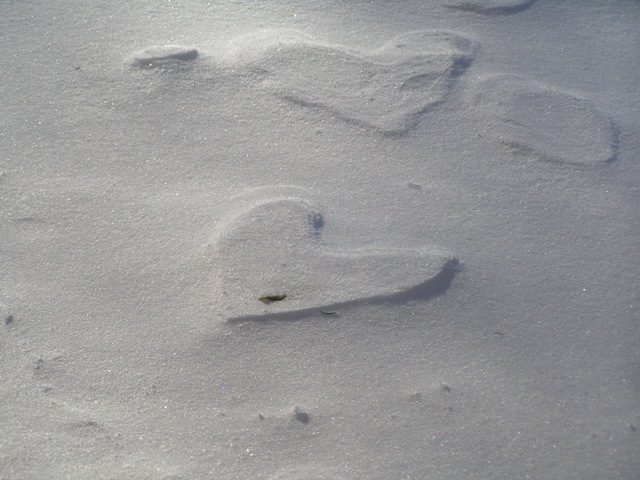 We had quite a bit of wind at that time, which sculpted these snow hearts on our back deck. Since we are without our camera for a week, I’m commemorating our first snowfall of the season with this fun pic. Currently it’s about 38°F (Is that about 4°C?) with lovely sunlight breaking through the clouds, so the snow is rapidly melting on our hill. I know the children are hoping, though, that the sky will cloud over and that more – MUCH more – snow will fall tonight. This entry was posted on Tuesday, November 27th, 2007 at 2:45 pm	and is filed under Fun Things. You can follow any responses to this entry through the RSS 2.0 feed. Both comments and pings are currently closed.